This weekend we were invited to L’Opera, Paolo Nesi’s flagship restaurant in The Fort, to make a new acquaintance: Sicily. Now in its 21st year, L’Opera is a stalwart on the Manila restaurant scene, consistently serving up deliciously authentic Italian food and good service. This time, we were in for a special treat, at the Sicily Champions League. Chef Paolo – Chef, Sommelier, Educator – lived up to all his titles for this event. He had created a menu with a matching wine list with which to introduce us to Sicily’s best wines and most popular dishes. We began with a long glass of Martini Prosecco and a short class on the history of wine-making on this, the largest island in the Mediterranean, perched on the tip of Italy’s boot-shaped mainland. With the aid of an easy-to-follow Power Point presentation, Paolo raced through the history of the grape in Sicily. Sicily appears to have changed hands with almost every passing century. The Phoenicians, the Romans, the Byzantines and the Spanish all had a positive influence on the developing local wine industry. The Barbarians turned their backs on viticulture in favour of beer, and the Muslims halted its growth for a hundred years or so, after invading Sicily in the 6th century. Yet, despite all the comings and goings of invading armies and colonization, the wine industry in the 21st century is alive and thriving. And the food has not suffered, either, from this smorgasbord of culinary influences. anywhere else in the world. Our first sample was a Fondo Filara Etna Bianco 2012 made from Carricante and Cataratto grapes, which are quintessentially Sicilian. Catarratto vines grow mostly in the west of the island, while Carricante has been cultivated on the slopes of Mount Etna for centuries. The volcano provides an almost melodramatic climate ranging from snow to hot sunshine, and a wonderful, mineral-rich terroir thanks to all that lava. 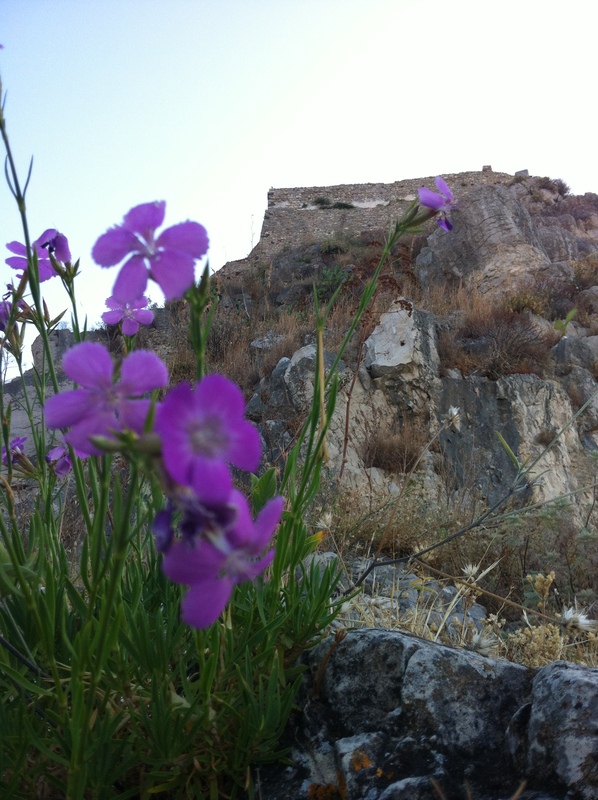 Generally the vines lie about 1000m above sea level, the added elevation also heightening the acidity of the grapes. Carricante is the dominant grape in Etna Bianco, and is popularly blended with Catarratto to create a light, bright citrusy wine with a dash of ‘apple and hawthorn,’ the acidity of the Carricante muted by the subtle gentility of the Catarrato to create a smooth, refreshing wine. It is a recommended accompaniment for ceviche or sashimi, so it was hardly surprising that Paolo had paired it with an assorted Sicilian appetizer that included a tasty swordfish carpaccio. This was accompanied by a orange and fennel salad sprinkled with Parmesan, refreshing and light, and bite-sized arancini, that traditional Sicilian snack of fried rice balls. Here the size of ping pong balls, they nested in a flavourful home-made tomato sauce, moist and moreish. I remember arancini well from a trip to Sicily three years ago. In the Palermo markets, arancini the size of cricket balls graced every food stall. And I clearly recollect a huge swordfish, sliced down the middle, standing head up, tail down in the local fish market, looking for all the world like it was diving through the counter. The second wine was the Red Queen to the White Queen above: a Fondo Filara Etna Rosso 2010 made from Nerello Mascalesce and Nerello Cappuccio. Grown primarily in Sicily and Sardinia, Nerello Mascalese grapes are believed to have originated in the Mascali area in Catania on the east coast of Sicily, but have since migrated up to the slopes of Mount Etna. 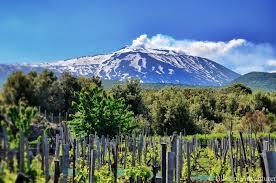 So these are tough vines too, for co-habiting with the largest active volcano in Europe means Etna is constantly blowing ash over them like a chain smoker at a party. Nerello Mascalese is often blended with Nerello Cappuccio, which adds both color and an increased alcohol level to the wine. This happy red wine was chosen to accompany a casarrece con pesto alla siciliana. Casarrece is a hand-rolled slim, scroll of pasta, slightly porous, and perfect for soaking up the sauce. Although it was a relatively light and delicate pesto sauce, the virile scent and taste of basil nonetheless stood up bravely to a wine described as ‘dry and robust’ with ‘elegant hints of wild red fruit, spices and liquorice’ and ‘a pleasant balsamic finish.’ I hope it is on their à la carte menu, this dish alone would be well worth a prompt return visit to l’Opera. Ragusano is a hard cow’s milk cheese produced in Ragusa, Sicily that Paolo has used to coat a fresh tuna fillet before sautéeing it in white wine: tonno alla Palermitana, presumably a speciality from Palermo. Personally I prefer my tuna simply seared as it is too inclined to dryness if cooked much beyond rare. Served, however, with an unusual black cous cous cooked with squid ink and seafood, the plate presentation was attractive, and the tastes blended well, neither dominating the other, the cous cous providing a riveting texture. The wine to accompany it was also riveting. The Bianca di Valguanera, it was generally agreed around the table, looked and tasted like a golden yellow, wooded Chardonnay. 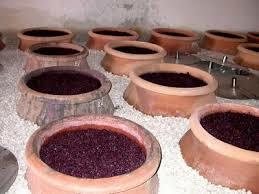 In fact, it is made from Insolia grapes. These grow primarily in western Sicily, where they are also used to produce Marsala wine. Recognized for its nutty aroma, the Insolia grape has many pseudonyms, including ‘Ansonica’ in Tuscany, but is described as a modest, unassuming grape of little character. And yet, this particular wine is quite distinctive. Perhaps it is due to oak fermentation, its intimacy with the yeast, or the bottle aging, but, like Chardonnay, Bianca di Valguanera has a complex intensity of both bouquet and flavour, and has been described as ‘aristocratic,’ with ‘good longevity.’ It is also quite difficult to come by, so sadly, it seemed, I wouldn’t be acquiring a case on my way out. Anyway, it is supposed to be excellent with strongly flavoured fish like salmon and tuna, so Paolo had matched it well. However, it could have been colder: room temperature did not do it justice. And onwards to the main dish: capretto al forno con patate e caponata. Some people at our table look aghast at the notion of goat, while others swiftly offer to eat any neglected offerings. Slow roasted, the goat was tasty but decidedly dry. My One & Only assures me that there was a sauce, but I must have had a mere splash, as a little moisture would have gone a long way. However, the roast potatoes and caponata – Sicilian ratatouille, as Paolo describes it – were a flavoursome mix. And the wines that arrived to pre-empt the goat were fabuloso. We were spoilt with two wines for this course: a Morgante Don Antonio 2010 – a pure Nero d’Avola – and a Cos Serasuolo di Vittoria Pithos 2012 – 60% Nero d’Avola, 40% Frappato – which is aged underground in open terracotta pots. Paolo described it poetically as a ‘beautiful woman without any make-up.’ I fell in love with the Nero d’Avola grape quite recently, although it was a long way from its Sicilian origins, having migrated south of the equator to the Adelaide Hills. There, the Bird in Hand winemakers were concocting a glorious, aubergine-coloured wine, full of plums and cherries and chocolate, and low in tannin. This Nero d’Avola is also full of dark flavours like sour cherry, espresso, cinnamon and blackberry, seasoned with pepper and a dash of oak. According to reviews it is best cellared until 2015. Looks like we caught it at its peak! Cos Serasuolo di Vittoria Pithos 2012 liked its dark tones too: namely cherry and chocolate. I have to admit I got totally submerged in the wine, and took little notice of the unassuming roast goat. Needing a breather from such a constant flow of food and wine, I wandered away to chat with a good friend at a neighbouring table – and nearly missed out on my Sicilian dessert medley. As it is now common knowledge that I do not have a sweet tooth, this may not have been an unmitigated disaster, but I was keen to try it out nonetheless. There were three contestants on our medley platter: a sponge cake soaked liberally in rum known locally as baba, and incredibly popular with the Sicilians; a shot of iced espresso topped with a splash of fresh cream, and a cannolo alla Siciliana, filled with sweet ricotta and chocolate chips. Cannola has never been my favourite Italian dessert, and I have to say this did not alter my perception one jot: a non-event that I willingly traded with my neighbour for another espresso granita. I was also more than happy to trade my final wine for another glass of my favourite “chardonnay-that-wasn’t”. While I am sure it was an excellent Sicilian fortified wine, its tongue-twisting sweetness suited my One & Only much better. So in the end everyone was happy. Buon Appetito! *With thanks to Google and my One & Only for their lovely snaps of Sicily. I sat beside my camera all night, at L’Opera, and totally failed to pick it up! This entry was posted in Food & Wine, Philippines and tagged L'Opera, Paolo Nesi, Sicily, wine. Bookmark the permalink.